Polycyclic Aromatic Hydrocarbons (PAHs) and soot share the same origin (incomplete combustion or pyrolysis) and nature, namely structural and electronic features. 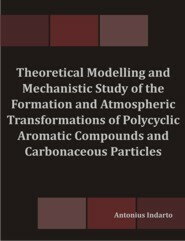 The purpose of the research work discussed in this thesis is to offer a theoretical contribution to elucidate some aspects of PAH and soot particle formation. The interest in carrying out such a work lies on one hand in the ubiquitous presence of both species in the environment, on the other hand on the concern for their impact on both human health, specifically involving the respiratory system, and climate, in particular as regards global warming. Thus, a better knowledge on the formation mechanisms of PAHs and soot could then help the efforts to reduce their concentration in our atmosphere. Since the formation mechanisms still presents unclear aspects, the suggestions and indications which can be offered by a theoretical study come out to be complementary to the large amount of experimental data collected so far. In setting up models aimed to mimic what happens in real pyrolysis or combustion situations, we have exploited the fact that PAHs and soot share as a common trait the presence of condensed unsaturated cycles (whose aromatic character can be variable). Thus, though types of soot of different origin will exhibit, on a larger scale, a variety of structural traits, we have chosen an assortment of PAH-like models to study different processes, together with other smaller unsaturated closed and open shell species that are known to play a role in the synthesis course. A preliminary phase of the study was aimed to assess which computational level could be both dependable and affordable to investigate the growth of a PAH-like radical when it is adsorbed onto soot platelets (particle phase). Then the Bittner-Howard variant of the widely accepted Hydrogen Abstraction Acetylene Addition (HACA) growth mechanism has been explored by Density Functional Theory (DFT) at the level mentioned above, both in the gas and particle phases, and over a wide range of temperatures. A parallel mechanism, differing from HACA, based on polyynes and characterized by the proliferation of radical centers, has also been studied for a variety of models at a multiconfigurational theory level. To the end, we have explored several reaction pathways starting from the addition of the propargyl radical to butadiyne.